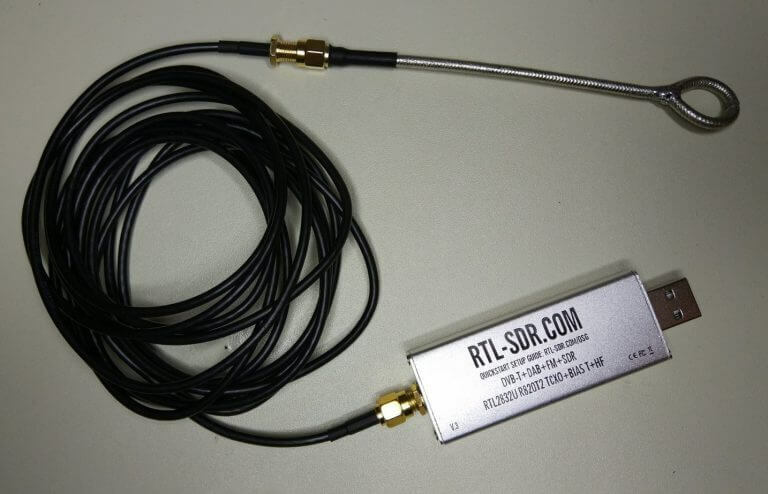 Thank you to Dimitris for submitting his article on creating an RTL-SDR based EMC probe. An EMC probe is a device that can be used to detect electromagnetic interference leaking from areas on electronic devices. For example an electronic PCB might have problems with RF leaking into other components. With the probe you could determine where the leak is coming from. To create the probe he uses a 30cm semi-rigid coax cable and an RTL-SDR dongle. The semi-rigid coax is cut in half, the center conductor stripped back, then looped around on itself and soldered to the shield. Dave from EEVBlog did a video on this previously which is what inspired Dimitris. The next steps are simply to connect the probe to an RTL-SDR, put it into direct sampling mode and probe around for signals. Note that an RTL-SDR with direct sampling like our V3 model, or an RTL-SDR with upconverter is required to receive signals below 24 MHz. His results show that he was able to successfully probe an OCXO oscillator, by seeing the 10 MHz signal in SDR#. The rest of his post goes on to discuss the limitations of this method, and compares it against professional EMC probes available on the market.